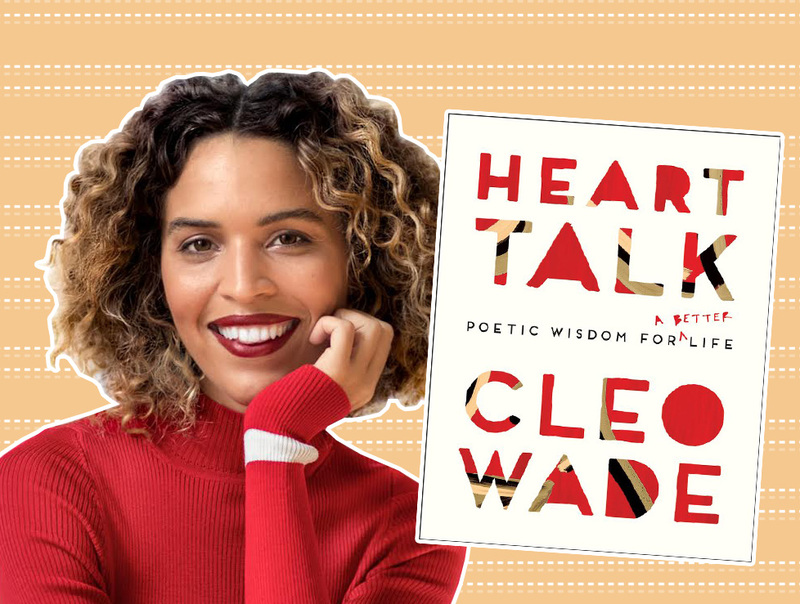 We had a heart-to-heart conversation with Cleo Wade about her new book, "Heart Talk"
When I first held Cleo Wade’s book Heart Talk: Poetic Wisdom for a Better Life in my hands, I swear I felt a powerful rush of energy flow through me. She wrote this for me, I told myself while I read her words. I’m sure of it. Wade’s book of mantras, affirmations, pep talks, and poetry is a heart-to-heart conversation you can hold in your hands and have over and over. It’s written in her friendly signature style that we’ve come to know and love. Even if you’ve never met Cleo Wade, she still feels like a best friend. Despite having over 336k Instagram followers, her posts feel like they were written to you, and you alone. She signs her notes like she’s wrapping up a personalized greeting card: “Love, Cleo.” You get the sense that she cares deeply about you, her reader. And she genuinely does. That’s the Cleo Wade effect: a calming yet energizing sense of can-ness. Her words remind you of all the things you’re capable of: listening to yourself, loving yourself, releasing judgment, embracing joy, and choosing love. We spoke with Wade about Heart Talk, her writing process, and how she deals when she feels the negativity creeping in. HelloGiggles: Was there one specific moment that drove you to write Heart Talk? Or did it gradually build over the years? Cleo Wade: It gradually built over the years. I wanted to create something people could hold and also a way people could have a relationship with my work during their offline hours too. For me, a huge part of my self-care is the time I take to myself away from my phone to read in the bathtub or before bed. I wanted to make work that people could enjoy in that space. It was also incredibly important to me to create something that I felt was beautiful and also really useful. HG: Is it difficult to maintain such a positive outlook and tone of voice? What do you do on days when you feel the negativity creeping in? CW: I really work a lot with mantras. We cannot control what thoughts pop into our head, but we have a lot of control when it comes to directing them to healthier places. If I feel negativity, shame, anxiety, doubt, or fear-based thoughts popping up, I usually repeat a mantra over and over to guide me to a braver more positive place. HG: The notes in the margins are such a nice touch. At what point in the writing process did you add them? CW: That was actually the last touch of the book. When I was going through the last draft I felt moved to add some extra notes. I kept my original notes rather than editing the text because I really don’t want the reader to treat the book too preciously. This is the book that should really live with you. Rip a page out and stick it on your fridge or your mirror, write in it, fold the pages, spill pasta sauce on it, etc. HG: Where do you find inspiration in your day-to-day life? CW: Mostly from my tribe of female friends. I really don’t think you can be a good writer if you aren’t a good listener. Choosing to listen with compassion, patience, and love is an incredible gift not only to your friends, but to your own soul. HG: Any advice you can share with those who are trying to be more open with their heart? Pick up a copy of Heart Talk: Poetic Wisdom for a Better Life now! And follow Cleo Wade on Instagram for your daily dose of love.